If this doesn't make you ache for a rain barrel, I don't know what will! Within the first few minutes of a very severe (yet brief) thunderstorm, the rain barrel was completely full. If we have a dry week, this volume will keep my vegetables watered. You would not have wanted to be caught outside during this very short storm we just had! Edited to add the photo below: 20 minutes after the storm started, the sun's rays beat down upon us once again (we had another 100+degree day today). Out and about, the storm appears to have been more serious than I thought! Below, the 12-year old bracing herself with her skateboarding helmet during the thunder and power outage. After she realized I was taking pictures, she began running around avoiding my camera. Maybe because she still had that nasal strip on her nose that we were playing with earlier in the day. Maybe because she was frantically busy preparing a "disaster pack" (canned food, her favorite stuffed animal, her cell phone, etc.). Here she is, running upstairs to avoid the camera because she's not too old to pack her favorite things during a scary thunderstorm, but too old to want any physical record of it! Too precious. Here's the 5 year old, not too embarrassed to show us what she put in her disaster pack. She's wrapped in Nana's blanket (which prevents bad dreams), and in her box - a wind-up flashlight, 2 cheese sticks, a juice box, and a picture she'd just drawn. What else would one possibly need? You have them in your place? Hope all had passed without any major damage. What a storm! I hope the kids appreciate it, even as they're preparing for the worst. I still enjoy the primal dousing a good storm brings. I'm lamenting the fact that my 70+ gallons of store rain got used before May was out, and we've had only tiny fractions of an inch since then--nothing worth standing the rain collectors at the eaves of the house for the few ounces of water they'd collect. Ooh, that does look like a wicked storm! We've never done the emergency packs here, but the kids won't get to the safe room until they wrangle the dogs. I try to tell them dogs usually survive disasters, just get in the room. Your kids are so cute! I had to laugh at the photo problems with the 12yo. My kids would always pose for me....until the day they turned 12. Now they run. Your kids are very cute and lovely. I think we are used to thunder storms here. Occassionally we have mudslides, landslides and felled trees but many of us are not bothered with the emergency preps. Hi Wendy - I love the title of your blog "Greenish Thumb" - thank you for coming by my blog. I'll be back to your blog, too! That looked like quite a storm. And your children are cute. How lovely that your daughter has a Nana blanket to keep bad dreams away. I love that. Your girls so funny ;-) I hope the storm is not going to bad one afterall. Rain water is best for plants. I will just bring out pails to collect the water with it rains heavily. No permanent space for a big barrel. My brother vacationed in Toronto, Canada last week and he said it was HOT there and then there was one day they had a thunderstorm. After the storm, the sun came back out and it was hot again. I guess it's happening the same for you guys too. Take care and be safe! James - I forget about the areas in which rain is a rarity during certain seasons! Joey, Ami, Stephanie, Meredith, Lynn, Sylvana, Thanks for commenting! I will definitely look at these blog posts one day with such fond memories. Meredith, I think your'e right that this task of preparing "disaster packs" kept any potential fears at bay - it was a scary little storm! Rose Belle, Autumn Belle, Florida Girl, James - Thanks for commenting! My older one was really joking around with her disaster pack idea (at least in the most part!). Honestly, I haven't thought seriously about creating some sort of disaster plan, besides, "run to the _____'s house". We did pack something for the dreaded Y2K several years back. This storm though, knocked out power all over our county. 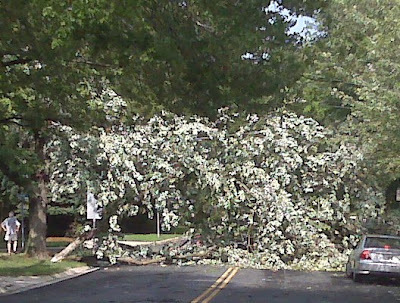 Camps were closed yesterday, I couldn't go in to work, traffic signals were out, it's a mess out there still today! We didn't really predict this! Wendy, your daughters are adorable! I think we had that severe weather, too. And it was even hotter and stickier afterwards! What a summer!! Been longing for a nice big rainstorm...maybe not. We have 2 rainbarrels. http://nycgardening.blogspot.com/2010/07/finally-storm-clouds.html I always ask other rain barrel owners, how do you get the water out of the rain barrel? We let gravity get the water out, but it's not so great.